Q. My Harvard Business Review course reading only shows the abstract. How do I get full access? Harvard Business Review has restricted access to 500 articles offered in the EBSCO databases, worldwide. The full-text PDF of the article can be read and saved, but not printed. In addition, we cannot link directly to the article in our course guides. This decision from Harvard has resulted in the error message you are seeing. We apologize for the inconvenience they have caused. 1. 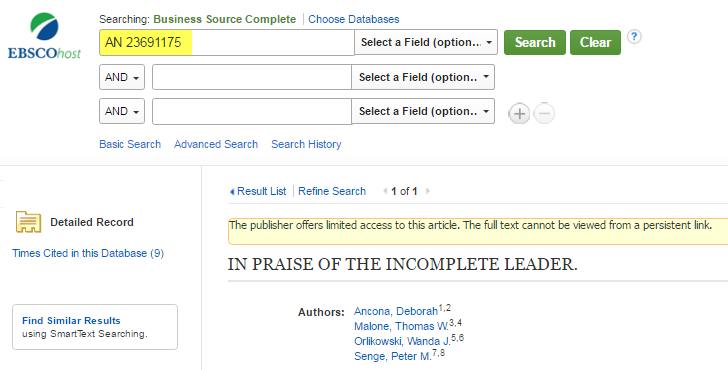 Once you click on the Course Reading article link, you will see a page in the database that states the publisher offers limited access to this article. Ancona, D., Malone, T. W., Orlikowski, W. J., & Senge, P. M. (2007). In praise of the incomplete leader. Harvard Business Review, 85(2), 92–100 . 2. In the search first field, you'll see letters and numbers listed. Leave them as they are and click Search. 3. You should see your article listed. Click on the PDF Full Text link to view the article. Why can't I print or save some articles from Harvard Business Review?